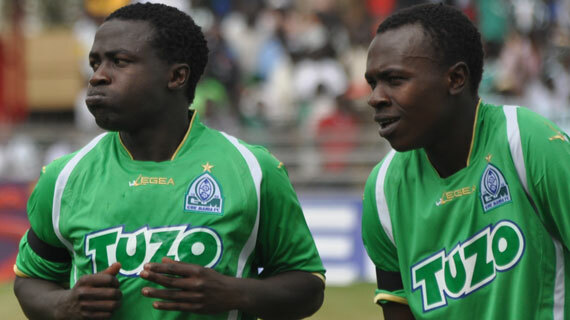 Gor Mahia’s Kevin Omondi and Paul Were of AFC Leopards have been suspended from Harambee stars and sent home from camp. The two speedy wingers who frequently showed the South Sudan defenders a clean pair of heals were equally adept at escaping from the Harambee stars camp. The duo were suspended after they sneaked out of camp without permission after having been paid their allowances. For Paul Were, this is not the first time he has been suspended for such behavior. Back when he was selected to play for the national U-20 side, coach Vincent Ombiji had no option but to suspend him. At the time Were was missing from camp, Ombiji was frantically calling him on his cell phone. When he finally reached him, he (Ombiji) could here loud music in the background. Thus despite Were pretending to be at home, Ombiji knew he was out clubbing. For Kevin Omondi, this his first disciplinary faux pas. Kogalo fans will hope that he will have learned his lesson from this experience. FKF Chairman Sam Nyamweya has announced that further sanctions await the duo at club level. The flip side however is that Omondi can come back home and rest his muscles in readiness for next season. 1. Alcohol causes dehydration which takes several days to recover from. 2. Alcohol decreases in testosterone are associated with decreases in aggression, lean muscle mass, muscle recovery and overall athletic performance. 4. Alcohol consumption causes large amounts of lactic acid to be produced, this results in decreased energy, decreased muscle recovery, and increased muscle soreness and makes a player more prone to muscle injuries. Having said all this, it must be mentioned that this is Omondi’s first transgression. He is not a rogue player and if given good advice, he will learn from this. The man is talented but as of yet has not fulfilled his potential. Continuing to behave like this will hinder his progress. As has been noted above, alcohol severely hinders a players chances of fulfilling their potential. Lets hope he styles upp and focuses on becoming the best that he can be. Kevin Omondi was in inspired form as he helped Kenya overcome South Sudan by a score of 2-0. Deployed on his preferred wing position, he and Paul Were, the other winger gave the South Sudanese a torrid time throughout the 90 minutes. It was “Kevo” who was the first to have an attempt on goal. But his 4th minute effort went inches wide. He was at it again on 35 minutes but his effort once again sailed wide. In the meantime David Ochieng of Sofapaka had given Harambee stars a 1-0 lead when he headed home a corner kick. Edwin Lavatsa came on as a substitute for Anthony Kimani. But it was the other substitute Clifton Miheso who scored Kenya’s second goal. David Owino once again stood tall in defence. Rama Salim did not see action this time, having been replaced by Mike Baraza. Thw win albeit against South Sudan is a welcome relief for Kenya fans as the national team has been on a lengthy loosing streak. Stars fans have become so used to poor results that a loss or a draw against South Sudan would not have come as a shock to anyone. Gor Mahia Coach Zdravko Logarusic admits he is unsure about his future after his contract talks with the Tusker Premier League (TPL) giants hit a snag. In an interview with futaa.com before departing to Croatia for Christmas holidays, the award winning tactician said the two parties have not agreed on personal terms ahead of the 2013 season. -I am leaving for Croatia and I have not made any agreement for the next season with Gor Mahia until now. Asked if he’s been approached by any other club, Logarusic reserved his comments. -No. I am just talking about Gor and I am leaving without any agreement with them, insisted Logarusic. Logarusic joined Gor in March 2012 turning around the fortunes of the club as he led them to a 27-game unbeaten record. Under his watchful eye, K’ogalo won two trophies (Top Eight and FKF President’s Cup) and finished second on the log in the just concluded season. Logarusic jetted-out of the country last evening (Sunday 25 November). Kenyan Premier League December–January transfer window could well be set for major action with giants AFC Leopards going public to state that they are eyeing a swoop for Gor Mahia captain Jerim Onyango. Leopards chairman Alex Ole Magelo confirmed the club has had contact with the player and even agreed to a meeting where a number of issues pertaining to the move would be discussed. Ole Magelo said he was optimistic that the two parties will reach an agreement over a move ahead of the 2013 league season. “We are interested in getting him to our team after a disappointing season in the goalkeeping department and we have even approached him over a possible move to Ingwe. So a meeting is scheduled where we will discuss a few matters over it and I hope we will reach an agreement because we want an experienced player like him,” he said. On contacting the player, he acknowledged that indeed Leopards officials had spoken to him about a possible move but said no deal has been reached yet, verbally or in writing, and confirmed a meeting was scheduled. “Some people from the club talked to me showing their interest in signing me for next season but it was just that; nothing was agreed, neither verbal nor written. I will be waiting to see how things go from now on.” Jerim said. The player has been in fine form for Gor mahia as the team marched to a second place finish in the KPL. Harambee stars “B” went down to Uganda thanks to a 74th minute goal in their first match of the 2012 CECAFA cup. Kenya is sending what is essentially a second unit to Uganda after coach Henri Michel decided to focus on the CHAN encounter with Burundi. Rama Salim and David Owino started the game. Rama was in the thick of action throughout the match. In the 39th minute he was harshly ruled offside by the Burundian referee. David Owino acquited himself well combining with Jockins Atudo and Abdallah Juma to keep the hosts at bay for most of the game. Kevin Omondi came in in the 72nd minute for Clifton Miheso. He immediatelt made his presence felt with his typical runs down the flanks. In the 79th minute he set up Humphrey Mieno with an excellent throughball but Mieno fluffed the chance. In injury down he went racing down the flank and sent a cross which was handled by a Ugandan defender but the referee ignored pleas for a penalty. Edwin Lavatsa remained on the bench and did not see action. All in all a dissapointing but not a bad performance by Harambee stars considering that this is a B team that had only 3 days to prepare. Once again, FKF and KPL failed to synchronize their activities in order to give stars adequate preparation time. His looks may be deceiving, his size too, but the Ugandan stands tall above Kenyan footballers. Dan Sserunkuma has been crowned Kenya’s best player. So tiny is Sserunkuma that the trophy he was awarded was nearly half his height. But there is no denying that the 22-year-old Gor Mahia striker deserved the accolade. He is also quite shy, but what he cannot say with his mouth, he does with his feet. He has taken Kenyan football by storm, scoring almost at will. 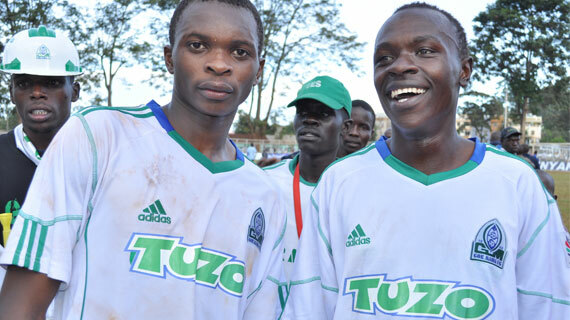 His prowess saw Gor Mahia come within one point of winning the 2012 Kenyan Premier League title. And when Sports assistant minister Kabando wa Kabando called out his name during the awards gala at the Safari Park Hotel on Wednesday night, he got a standing ovation. He had become the first foreign player to be named most valuable player (MVP) in Kenyan football. The sight of Sserunkuma with the ball has constantly sent chills down the spines of many a defender and goalkeeper in the Kenyan league. Ask Muhoroni Youth goal-keeper Josek Gituma who found three shots from Sserunkuma too hot to handle, or AFC Leopards’ Patrick Matasi, who picked the ball twice from the net. “He is lethal and difficult to mark,” said Tusker FC defender Jockins Atudo. Those who coach him say he is achieving all this because of his discipline. Sserunkuma started playing professional football at Ugandan team Express in 2008, and after one year moved to rivals Victors FC, where he stayed for two years. The Tusker Premier League side, Nairobi City Stars, signed him up early last year. “I had heard about Harambee Stars and top clubs. I knew little about City Stars, but they are the ones who were to bring me to Kenya,” said Sserunkuma. At City Stars Serenkuma was rarely in the news for any wrong reasons. Even when the club had financial problems, he never publicly demanded pay. Gor Mahia finally knocked at his door in June. He had already scored five goals for City Stars, including one against Gor Mahia in the league. Immediately, he made an impact at Gor, scoring on his debut for the club. He went on to score for the 12th time in Kenyan champions, but eventually missed the golden boot award by a single goal. With the MVP award in his cabinet, Sserunkuma says he is eyeing even bigger things — winning the league title next season. 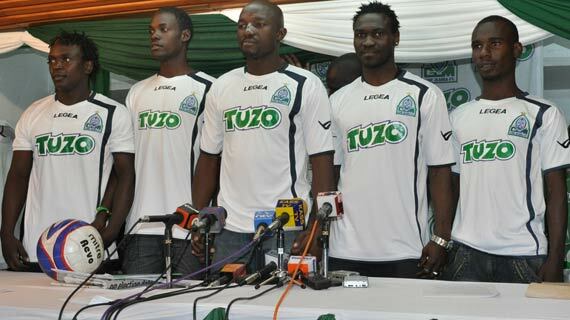 Gor Mahia was the most awarded team at the 2012 Footballer of the Year Awards. Dan Sserunkuma won the coveted footballer of the year award , finishing ahead of Paul Kiongera (KCB) and Mika Baraza(AFC). Sserunkuma has been in sensational form scoring freely and giving defenders and opposing coaches plenty to think about. Coach Zdvarko Logarusic was voted coach of the year after taking Gor Mahia from relegation candidates to contenders. Anthony Akumu was voted midfielder of the year. After a down year (2011), in which he seemed to lack motivation, Akumu is now back in the form that saw him earn a trial at Randers FC. 3. Stanley Okumbi – Mathare United. Newly crowned 2012 FKF Cup champions Gor Mahia have been assured of the federation’s full support as they plan to represent the country at the continental stage. Through the chairman Sam Nyamweya, Football Kenya Federation has revealed that it would ensure that the club went the full hog and with utmost ease by helping to mobilize resources. -I would personally spearhead an aggressive funds drive for Gor Mahia in January 2013 to ensure that the club raises funds to comfortably compete at the CAF Confederation Cup that year, assured the chair. Gor Mahia will represent the country in the 2013 edition of the CAF Confederations Cup tournament in an effort to place Kenya squarely in the continental map. K’ogallo was knocked-out of this year’s tourney following their 0-1 loss to Ferroviaro de Maputo, on Saturday 10 March, at Nyayo National Stadium. The Mozambique based-side advanced to the next round on 4-0 aggregate. In a repeat of last year, Gor Mahia beat Sofapaka in the FKF cup final, this time on penalties. The hero of the evening was Tanzanian standout goalkeeper Ivo Mapunda who saved two penalties to sink Sofapaka. Kogalo were certainly under no illusions as Sofapaka has over the past 3 years proven to be a very difficult nut to crack. The match was evenly balanced. In the first few moments of the game, Kevin Omondi came close when he picked up a pass from Moses Odhiambo, made a dangerous run into the Sofapaka area but his shot was saved by the Soafapaka goalkeeper Duncan Ochieng. Ivan Anguyo then saw his long range effort go over the bar. Sofapaka came close several times with efforts from Joseph Nyaga and Humphrey Mieno. In the second half, Logarusic brough on Edwin Lavatsa for the off color Dan Sserunkuma. The match continued to be evenly balanced with both sides pressing for a goal. In the penalty shootout, Eugene Asika and Abdalla Juma’s saw their penalties saved by Mapunda. Humphrey Mieno then sent his ffort over the bar. Meanwhile Gor Mahia had scored via Ivan Anguyo, Moses Odhiambo and Rama Salim. The win presents Gor Mahia another chance to play continental football and perhaps redeems themselves after the disastrous campaign of 2012.